Please click here to see all posts, most-recent at top. For newer posts on a subject, please pick a displayed Label at the bottom of the post, or pick that Label from the Labels list at right of page. In two jobs of attic floor insulation, and again in the completion of a kitchen remodel in my home, I have made a thorough try of mineral wool batt insulation by Roxul, company now called Rockwool, and by Owens Corning, product called Thermafiber. One experience is summarized in this post. All are collected in blog posts search; Label: Mineral Wool Batts. I am late in preferring mineral wool batts to fiberglass because I work mainly in attics and crawl spaces, where mineral wool has seemed difficult and extravagant. In fact, real momentum in the deployment of mineral wool batts is since the 2013 acquisition of Thermafiber by Owens Corning. This 1918 home has excellent 4 ft wide roof eaves sheltering windows and walls and giving an 18" tall attic perimeter. R49 attic floor insulation out to exterior walls is uniquely possible. Good elevation over exterior walls is an asset to running modern wiring down the exterior walls. The attic has been barely accessible, dark and dangerous. Despite hostility, the large attic has household items preserved in storage. There is appearance of thick insulation, but many defects reduce effective value to a very poor R5. After the attic floor has been framed to support an attic ladder, set a barricade to contain dust and plaster chunks of new attic access cuts conveniently aligned with a stairwell. The found 2x6 attic floor joists will be strengthened to 2x12, with box beam methods. Build and install a ladder rough opening frame, using select 2x12 lumber. Bahco hand saw cuts through lath and plaster are guided true against the RO frame that is well fit to the ladder frame. 11 1/4" plywood rips serve as box beam webs. Beam top elements are longest-possible 2x4. Everywhere the found loose-fill mineral wool is only 2" deep; found batts draped over that had no value and has been in my way. I am happy to reset all found fiberglass batts within the box beams, packed intimately and with much elimination of framing thermal shorts. Found fiberglass batts are progressively shaken free of dust and roof debris upon sheets and into 55 gallon drum liners, piled and rationed as base fill within variable spaces below the level of flooring 2x4 nailers. I started out knowing only of Rockwool batts, available as R15 and R30, and in unrated 2" thickness. Cut batts 23" wide, to lengths (shorter dimension) accurately fitting framing spaces, using a long commercial bread knife. 18" tall perimeter vertical framing is continuation of exterior walls below, always with closure of cavities in the attic floor (not balloon framing). Hard-covered insulation is 12" thick. I am able to go anywhere in the careful placement of wiring, lighting and new fans, then to be capped with a maximum depth of insulation. In a final, nicely-accessible zone 54” wide at the North end of the attic, show learned exemplary use of mineral wool batt insulation. I ran out of found wimpy fiberglass for the base layer. At LHS, 2” of loose-fill mineral wool gives intimate bedding on lath and plaster roughness. Over that add R11 kraft-faced batts and R8 mineral wool batts, a total of R21. Crossing Thermafiber R30 batts 24” by 48”, 6” thick, bring the total in 11.5” depth, to true R49. Over the master bath drywall at RHS, there was no found loose fill. begin with R11 unfaced batts for 1 1/2” fill to tops of on-flat 2x4s found. Make note of more insulation stack-ups in 2x12 box beam caviies, exemplary of the use of mineral wool batt insulation, rarely disposing found insulation. This is typical. I gave up on the use of housewrap strips after nearly hurting myself with kick of a circular saw dividing the plastic housewrap roll. Never again! Note batt stack-up nearing attic completion, with little remaining found-fiberglass and no raised flooring. Total about R52. What else might one do to achieve serviceable insulation greater than R49? Top-layer R30 batts 24” x 48” are placed, and may be retrieved, from the flooring edge. A covered bath fan and lights will need service someday, then not destroying insulation. The stackup will vary with what materials are at hand, and with needs to fit objects buried. This is the Fakro LTK 25/47 attic ladder leading to the completed attic now very energy-efficient, and useful. Summarize the placement of 1/2" CDX plywood, 22.5 sheets reassembled from 24" rips. Summarize the best energy-savings opportunity, closure of attic floor pits. I employ a concept of "equivalent bare area", to collect the savings value of closing air tight and insulating over the pits. 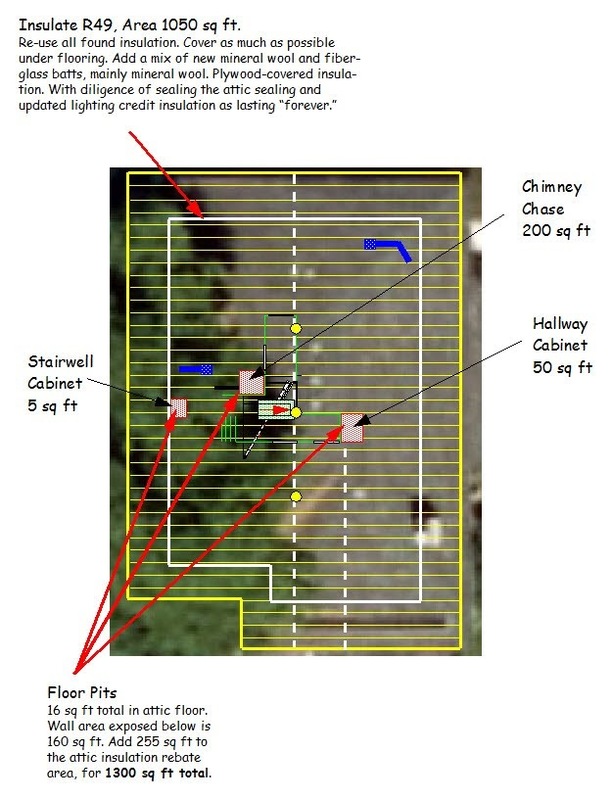 Here are summary photos of the floor pits as found, and as closed. The opportunities are mostly associated with drop ceilings of closets, now closed or filled full. Electricity generation from U.S. nuclear power plants totaled 807.1 million megawatt-hours (MWh) in 2018, slightly more than the previous peak of 807.0 million MWh in 2010, based on preliminary annual data. Although several nuclear power plants have closed since 2010, a combination of added capacity through uprates and shorter refueling and maintenance cycles allowed the remaining nuclear power plants to produce more electricity. In the near future, however, EIA expects that U.S. nuclear power output will decline. Solar power in the United States includes utility-scale solar power plants as well as local distributed generation, mostly from rooftop photovoltaics. As of the end of 2017, the United States had over 50 gigawatts (GW) of installed photovoltaic capacity. In the twelve months through December 2018, utility scale solar power generated 66.6 terawatt-hours (TWh), 1.66% of total U.S. electricity. During the same time period total solar generation, including estimated small scale Generation photovoltaic generation, was 96.1 TWh, 2.30% of total U.S. electricity. 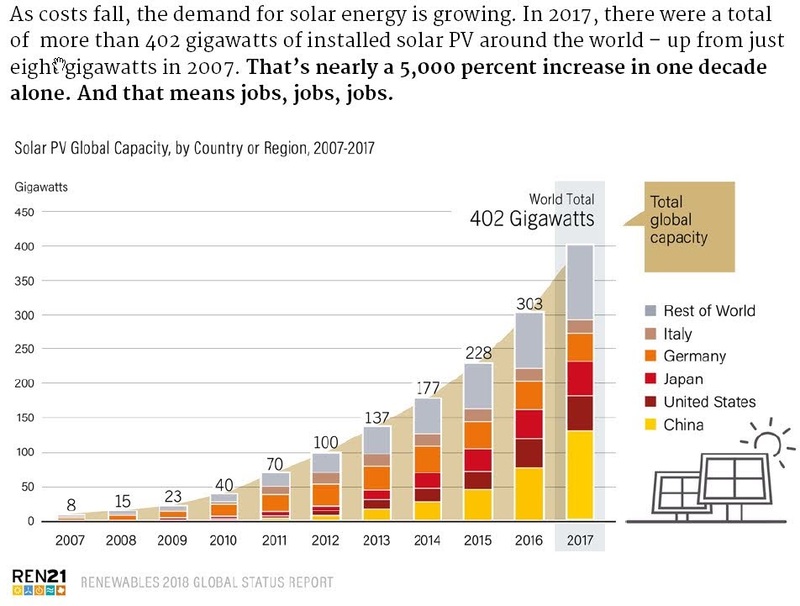 In terms of total cumulative installed capacity, by year end 2017 the United States ranked 2nd in the world behind China. In 2016, 39% of all new electricity generation capacity in the country came from solar, more than any other source and ahead of natural gas (29%). By 2015, solar employment had overtaken oil and gas as well as coal employment in the United States. In 2016, more than 260,000 Americans were employed in the solar industry. One terawatt is 1000 gigawatt, 1,000,000 megawatt, 1,000,000,000 kilowatt. We have an achievable goal, to increase solar capacity by about times fifty. Property assessed clean energy (PACE), a popular, long-term financing tool for energy and water conservation projects, has grown quickly in recent years across the United States. The PACE market increased by 75% from 2016 to 2017, completing $251 million in funding by the end of 2017, according to PACENation, a private advocacy group. The impact is significant. Commercial PACE funding has cumulatively saved 6.3 billion kWh, which equals the electricity used by about 25,000 commercial office buildings each year. 63 billion kilowatt hours is 63 terawatt-hours, about the same as the 2018 achievement of solar power. We must not allow our challenges to be obscured by inconsistent units of incomprehensible numbers. At 3/25/2019, discover web site buildinggreen.com. Look for content on LED lighting, and find this. 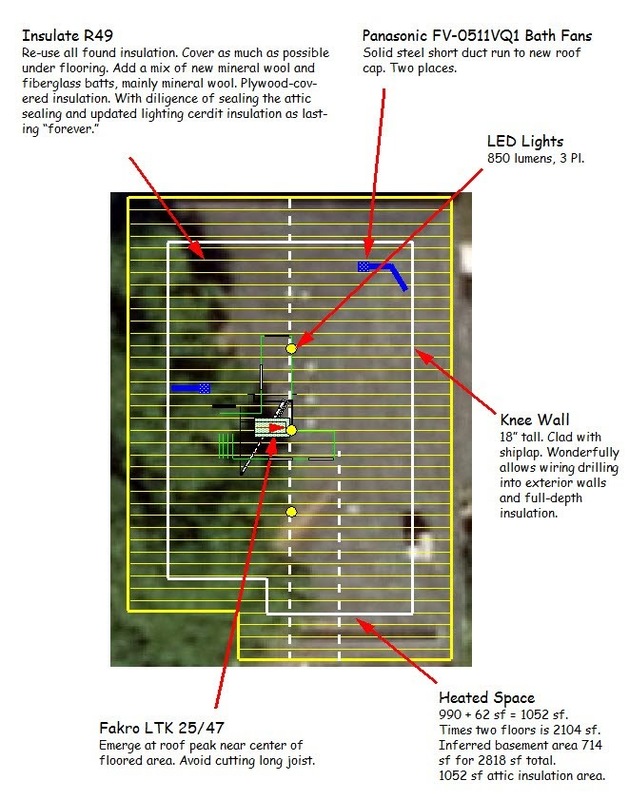 The information offered in this report generally revolves around lighting design that provides building occupants with the highest-quality illumination possible—providing comfortable and safe environments in which to complete their tasks—while using as little energy as possible. According to the Energy Information Administration, in 2010, lighting in U.S. commercial buildings required 297 billion kWh of electricity—about 22% of total commercial building electricity used in the nation. But technology has been rapidly evolving, and it’s becoming ever easier and more cost effective to drastically reduce the amount of energy consumed by lighting. In fact, LEDs have become so efficacious that additional gains in efficiency are small. The point has been reached where many in the lighting industry, who now see energy efficiency as a given, are turning most of their attention to the human-health component of sustainability and the ways that quality lighting can support it. 297 billion kwh is 297 terawatt hours. Divide by 0.22 to find claimed 1,350 terawatt hours total commercial buildings usage of electricity in 2010. We can develop wind and solar power capacity that eliminates need for any dangerous nuclear power. We must. How many solar panels do we need, to replace fossil and nuclear power? Find many citations at top loaded to defend fossil and nuclear dependency. 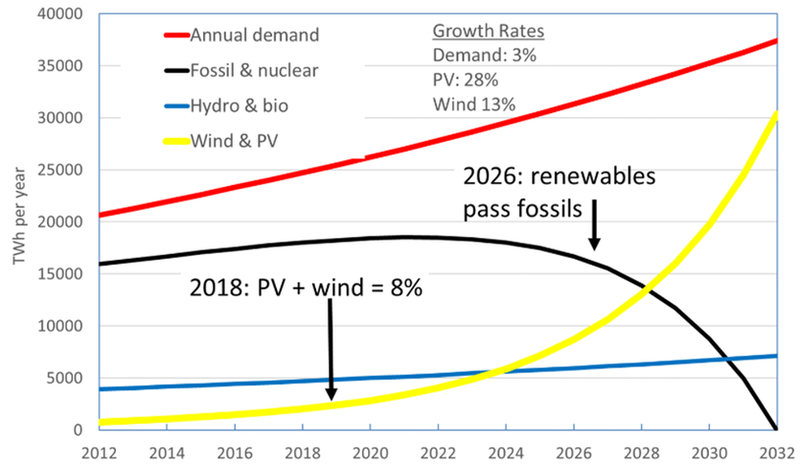 Read 13000 TWh as the year-2028 PV and Wind passing of fossil consumption, at a time with total annual demand of about 32000 Twh. Read year-2018 PV + Wind, as 2500 TWh. See that this is not consistent with number 96.1 TWh for solar power. See that the year 2028 crossing is with PV and wind output up by times 13000/2500 = times-five. Times-five increase in ten years is obviously achievable. We struggle with big numbers that we don't understand. USA capacity 10 2017, about 60 Gigawatts, in agreement with the Wikipedia listing above.. 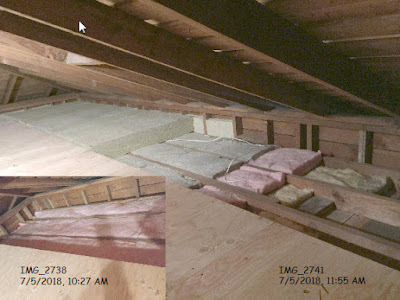 The furnace installation at right side in this composite photo is very typical of placement in truss attics. That at left side expresses possibility with more thought, and should be a preferred standard. Let's see what is wrong at right side. 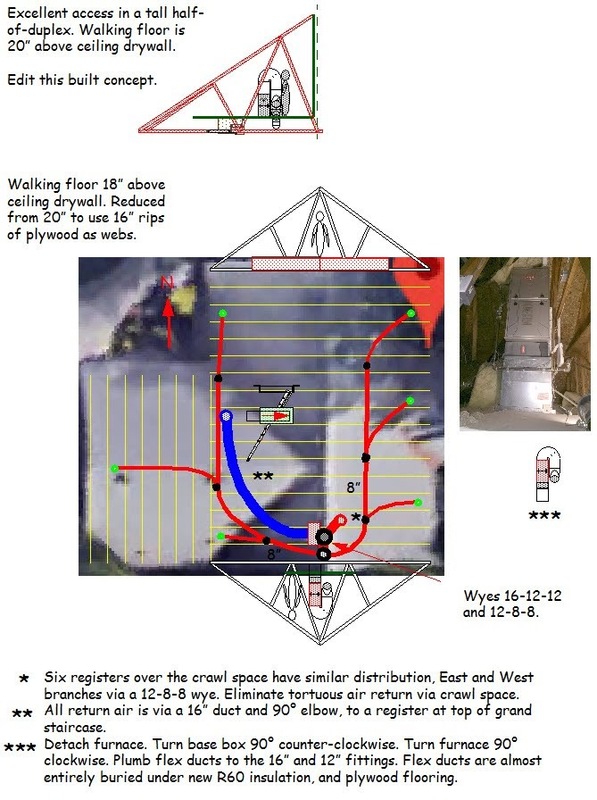 With the deep dimension of the furnace parallel to trusses, the return air at the bottom via a service box efficiently collects two 12" ducts in a wye, to 16" round inlet. 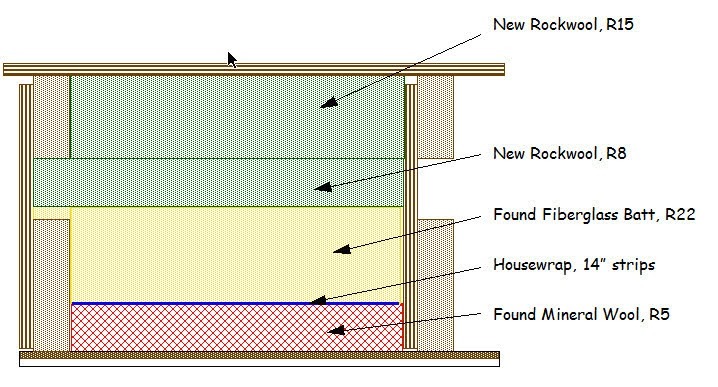 The output at top is then blocked by truss elements at sides, and a return must not obstruct front service doors and air supply and exhaust ducts. Output duct compromises at top are not acceptable. 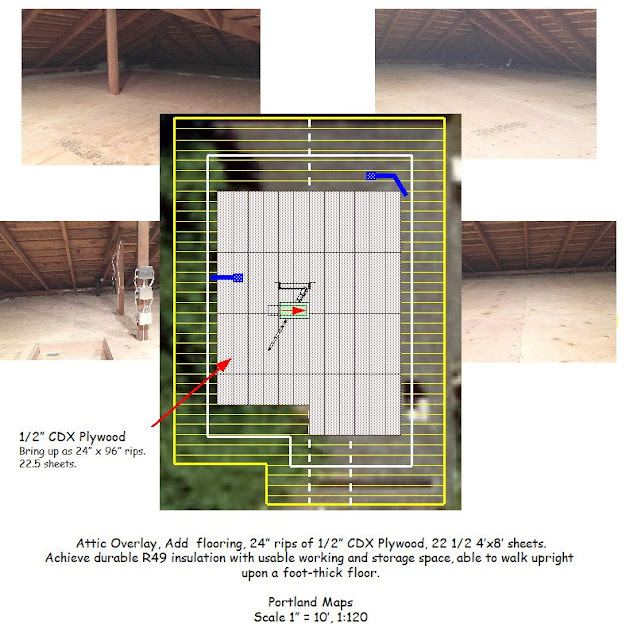 This furnace is only one truss bay distant from an end wall.Set closer to attic centerline and turned 90°, service doors then facing to left, could then be reached with best-headroom access along the attic centerline. The better installation with furnace parallel to trusses, yet needed lots of improvement. Here is the installation as I found it. Badly installed ducts, are in the way of harm, everywhere. Ducking ducts, one could at best get at the furnace access panels. The untrained "professional" installer ruined the side of the furnace, hacking on an oversize return box with no possibility of the imperative return-air high-efficiency filter. I will demolish all of this awful ducting less than two years old and blessed as conforming with required methods. Leaky and unstable duct connections to a D-box are hacked-in unsupervised at the job site. I will spend several hours dangerously stripping off goop and screws that might have achieved an airtight assembly. Worse to me, the assembly is hydraulic foolishness. Dampers full-open only add to the foolishness. There is a better way. It is October 30, 2017 in mild-maritime weather of Portland, Oregon, and the home will lack HVAC for several days. Here the furnace is reset on a raised floor with space below that will pass furnace-output flex ducts, under flooring, buried in the floor insulation. Is there a better way to place ducts in "conditioned space?" Here trial-fit the new, lined 180° turning plenum. Behind the furnace see bags of fiberlass insulation employed to fully stuff space under flooring, to R60. The new floor supports are up 20 inches from ceiling drywall. There is good return in filling all available space with insulation. The improved furnace has a insulated 180° turning plenum on top, directing conditioned air downward with ducts to be buried under a raised attic floor. A couple of vanes in the second 90° turn might do some good in reducing flow turbulence. Look down through the progression of wye fittings below the turning plenum, that keep air moving steadily at ideally a constant velocity. All of this guiding steel is with some cost of efficiency. Steel mass that responds to elevated temperature of each furnace cycle, has heat capacity. Heat capacity cooling or heating output furnace air, acts just like leakage of the conditioned air. Do what I can to reduce responding thermal mass, by palm-applying many layers of flexible grout. Flexible grout is insulating ceramic microballoons more than half by volume. I allege that the coating reduces responding thermal mass by more than half, a really good investment of my time with material cost-free. 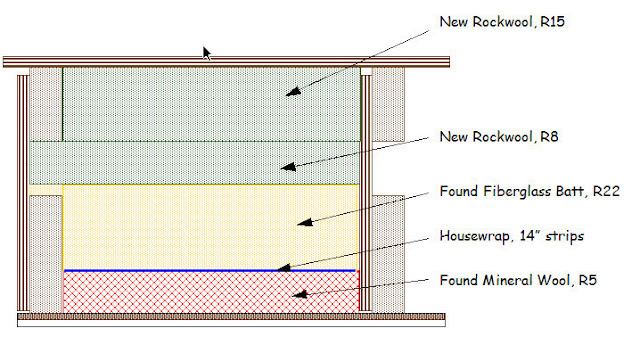 Framework that supports flooring, and passes buried ducts, can be complicated. There is a good R25 base layer of insulation under this ducting pit. It gets more difficult now, to tightly place insulation. ducts. With planning, excess R8 duct liner pulls up to cover almost all area of the non-lined steel fittings. Full wrapping is of about equal importance, to the internal lining of ceramic microballoons; neither perfect insulation. An in-attic furnace must have been thought necessary. I have perhaps minimized the penalties, while making the attic a well-lighted, useful space. Let's look around this now-pretty attic, reviewed in other blog post about its new access hatch cover and R30 insulation of a skylight. Finished attic, access beyond the skylight, two shelves nestled in trusses. Storage space was needed and affordable. no one may command that attics be left dark and dangerous, with precariously-hung, energy-losing tangles of flex ducts and pretend-only hatch and skylight insulation. Extensive flooring was essential to placing the R60 floor insulation, now protected for sixty years or more. I thing flex ducts sheltered from attic heat and pull-down in passage should survive far beyond warranted life of not more than 25 years. The creation of useful space was a very good investment and is perhaps affordable for anyone. Back now to the challenge at hand, an in-attic furnace adversely placed parallel to trusses and handily near an end wall. This time, the home owner has ample garage storage, and desire to cope with the bad furnace installation. I need to convince a reader that this installation is wrong. A builder should keep control over how the necessary in-attic work, is done. Perhaps the architect could have provided an interior furnace location. A builder must cope. So here we are. What could have been done differently, within the control of the builder? An alternative attic with furnace perpendicular to trusses, has excellent access. The found hatch then interferes with duct paths. A better access is possible. Here are found conditions of the badly-oriented furnace and badly-conceived HVAC ducts. I have pinioned my back and legs to move through the trusses in the alley at RHS. Appreciate the needless hostility of this attic, and the consequences to decrepit conditions. This one of the too-few soffit vents moderating temperature in the attic. The house was built in 2001, and I am the first person to see that the cardboard baffles are already falling-down. Two others are fully detached We must ban all that is not durable. Who now will fix this? How? The HVAC flex ducts will disintegrate within the next twenty years. Perhaps they will last much longer, buried, temperature moderated, not under tension. Shouldn't something be done here, now? I hope I will be allowed to fix this attic.I hope then that lessons shared, will cause an end of cheap foolishness. I am up here early in the failure cycle, only because there lately has been a loud clicking in the walls at each furnace startup. 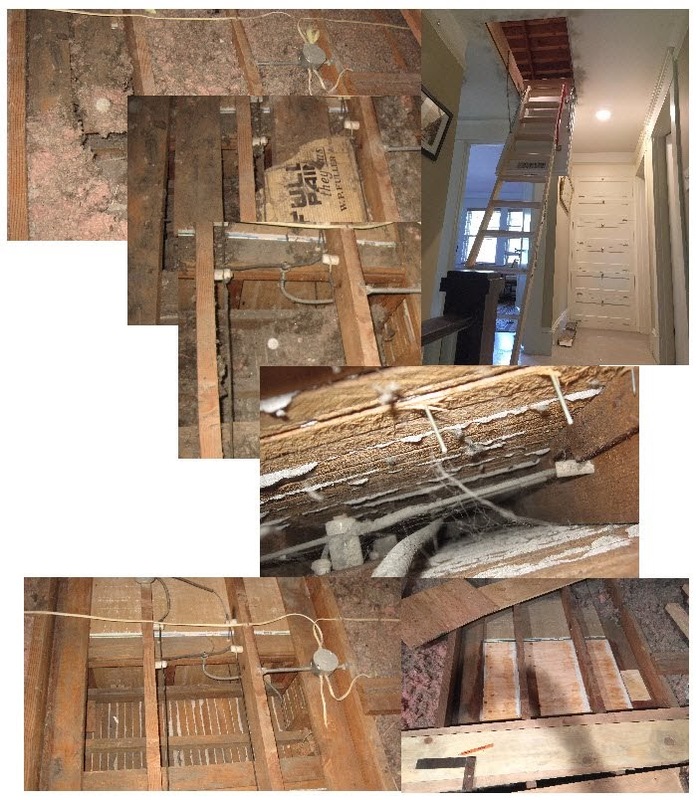 A 12" steel pipe connecting the attic to the crawl space and carrying conditioned air to floor registers of the first floor, was pinned against ability of thermal expansion. I was able to hack away the wood interference,. An attic furnace should be oriented perpendicular to trusses for best deployment of ducts. Hope that this post will be detected, and will lead a change of direction. https://www.energyvanguard.com/blog/73245/Go-Up-Go-Small-and-Get-Those-Ducts-Inside-Conditioned-Space (I don't like that duct Medusa. I think the USDOE reverse bulkhead idea has no traction. How could you get to ducts for service? Commenting on weatherization practices, materials and policies. Inventing improved weatherization practices, materials and policies.